We help super small creative business owners develop and maintain marketing strategies that are simple, realistic and fun so they can take control of their marketing and achieve their business goals. START HERE with the free Uninhibited Marketing Guide! If you're unsure of where to even begin your marketing journey, this free Uninhibited Marketing Guide is just what you need! Get a one page marketing foundation in under 30 minutes. 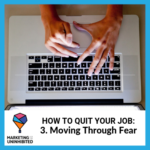 For the creatives out there, having a corporate job is about as stimulating as watching paint dry and your days are spent wondering what it would take to actually turn your post day job projects into a business. Can you actually sell enough candles to pay your bills? How will you afford the help you will need to get the business off the ground? Where do you even begin? What’s marketing? I had all of these same questions, although my career passion is marketing and not painting or personal training. I’m Miranda Rodriguez, founder and lead marketing consultant at Marketing for the Uninhibited. You're trying to decide if you can actually turn that creative passion of yours into a full-time job, huh? You'd like to be able to pay your bills, pursue your passion and pick up your kids from school. Lucky you, with a solid marketing foundation and strategy, we'll be able to grow your business so you can achieve those goals. Learn about our services here. Marketing is only half the fun. The Marketing for the Uninhibited Podcast is a conversational podcast, hosted by Miranda Rodriguez, with rotating guests that challenge the way we think about marketing across industries. Simple, realistic and fun, this podcast aims to inform and inspire. "I met Miranda at a WESOS (Women Entrepreneurs Secrets of Success) meeting. Within a few minutes of chatting with her I was struck by her professionalism and her experience. Let Go developed a marketing strategy that will help me with my rebranding. While the plan she created for me is involved, she prioritized the activities so that it is manageable. I am happy that she understands my vision and is excited about it. I look forward to seeing my business grow with Miranda’s help."